As owner of the small commercial airport, Westchester County faced an all-or-nothing deadline for the project on Aug. 15, 2016. The new facility not only had to be completed by then, but the screening and handling system had to be fully operational, or TSA would not provide a $10.5 million grant for construction and equipment. If contractors missed the target date, the county would not receive any of the federal funds, explains Vincent F. Kopicki, county commissioner of Public Works and Transportation. Because the grant had a "sunset deadline," funds would be reallocated elsewhere if not spent by end of the federal fiscal year, Sept. 30, 2016. Interestingly, HPN was the only one of three airports using "sunset" dollars that completed its project on time and received funding. An initial proposal for HPN's new baggage screening facility was submitted by project architect Graf & Lewent in 2008 with a series of other renovations for the 1996-era, four-gate passenger terminal; but the county did not act on the list at the time. 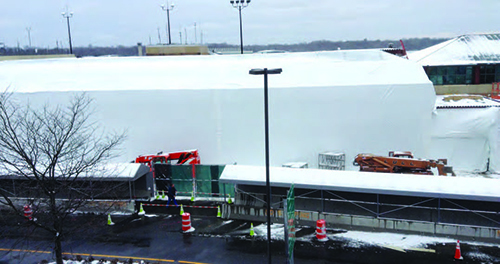 Active planning for the baggage facility, however, began in 2010. Steel Contractor: QSR Steel Corp.
public area to a secured location behind the scenes. In addition to improving security and safety for passengers, the change would free up space in the crowded ticketing lobby, explains Kopicki. Unlike most airports, however, HPN is legally prevented from growing. For more than 30 years, county laws have limited its passenger traffic to 240 passengers in any given 30-minute period. In recent years, traffic has averaged about 1.75 million passengers per year. Currently, the airport offers flights to 20 destinations on six carriers. Due to its suburban New York location, HPN markets itself as an easy alternative to the region's major airports-John F. Kennedy International, LaGuardia Airport and Newark Liberty International. 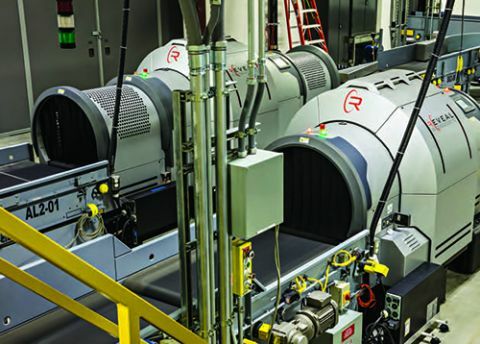 As the design team began preliminary drawings for the new baggage system, it quickly became apparent that a state-of-the art in-line screening system would not fit within the footprint that was initially envisioned for the facility. "The 5,000-square-foot addition would have been woefully inadequate," says Steven Lewent, principal at Graf & Lewent. "There would not have been enough room for the conveyors, sorting machines, screening devices and a hand screening room." The airport consequently expanded the addition to just more than 10,000 square feet. The building became an in-fill structure on the terminal's north end incorporating the separate fire station and ground equipment storage buildings. To match the existing buildings, designers added a second floor to the screening facility, Lewent notes. The second floor now houses offices of the airlines and TSA. The county challenged everyone, including the baggage handling system designer (BNP Associates), to design a scheme that would reduce operating costs but still meet TSA standards. The motivation was easy to understand, notes Lewent: While TSA would be picking up the tab for the building and screening equipment, the county would be responsible for ongoing operating and maintenance costs. 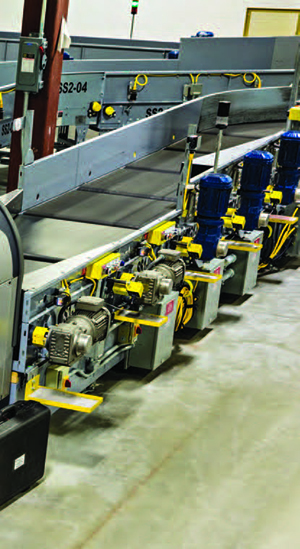 Designers scaled back and simplified some of the handling equipment to reduce operating costs, and the revised layout was dubbed a "mini in-line system." The new facility can screen about 380 bags per hour-a rate designated by TSA to match the airport's traffic level. Now operational, Kopicki says the system is working perfectly fine. "Other airports are looking at our mini system and wishing they had our system," he reports. Because of the design changes, TSA had to review new plans before the project could proceed. The new design was approved in late 2014, and the project was advertised in early 2015. The county bid the project at varying intervals and awarded the associated contracts at different times, with different completion deadlines. VRH Construction was selected as the general contractor responsible for building the shell to house the baggage screen system. Automatic Systems Inc. won the contract to install the new handling system with in-line explosives detection. VRH received its contract first, with a December 2016 completion date; ASI's contract was awarded later, with an Aug. 15, 2016, deadline. In order for ASI to meet its deadline-which coincided with the crucial completion date for TSA funding-it needed a fully enclosed space with all of the power, heat and air conditioning in place months earlier than VRH's original schedule planned. To accommodate, VRH began working on the project in August 2015 and turned over the first floor to ASI the following April. While the weather was still cooperating, VRH crews also poured the concrete floor, reserving "pockets" for future steel columns. An even bigger challenge arose after the steel was erected in January 2016. "We needed to get right into the masonry, and we were in the throes of winter," explains VRH project executive Steve Haussel. This was no small issue, as the building structure is made of cement masonry units with a brick facing on the exterior. The contractor consequently erected scaffolding around the building and completely enclosed it with plastic shrink wrap similar to the type used to weatherproof boats. Crews ran two diesel heaters to keep interior temperatures at 40 F.
"We created ourselves a little dome," remarks Haussel. "We were able to work through the coldest months of the year." While VRH has created similar cocoons for other foul weather construction, this was its largest, he notes. Crews added the roof after erecting the walls and removing the scaffolding. The contractor considered erecting the roof under the dome, but the extra height would have caused the project to interfere with airfield operations. When the first floor space was turned over to ASI, the concrete floor had been poured and steel decking was in place for the ceiling in the baggage screening area, but the roof was not in place. Unfortunately, White Plains received significant rainfall that spring, so workers had to squeegee the water into buckets to keep crews on the first floor dry. ASI consequently met the pivotal Aug. 15, 2016, deadline; and the entire project was finalized in October 2016. Future infrastructure programs at Westchester County Airport could rest in the hands of private investors. In April, the county issued a request for proposals from private investors interested in taking over the airport on a 30-year lease with the county. Proposals are due in July, and the county hopes to have the investment team selected within 30 days of the bid closing and a lease executed by the end of the year. If the county succeeds in obtaining the necessary FAA approvals, HPN would be the first U.S. commercial airport to be privatized under a 2012 FAA pilot program. Two other airports-St. Louis Lambert International and Hendry County Airglades Airport in Clewiston, FL-are also currently in the application pipeline. Commissioner Vincent Kopicki, who oversees the airport, notes that the county is exploring privatization to free up county funds from the airport to be used elsewhere in county operations. The recent $29.4 million baggage screening facility was funded in part with $9.8 million in county capital improvement funds. • improving aircraft deicing facilities and drainage. Three conditions that aren't eligible for change by potential new investors are the airport's 702-acre footprint, traffic limits and its current curfew on operating hours. Since 1977, the county has contracted with AvPorts to manage day-to-day operations.